More than a decade before we met Lindsey, God used a spot on the local news to lay the idea on my heart about adopting a teen. Life went on and I forgot about it. Several years after marrying Ken and blending our families, the idea of adoption resurfaced. Ken and I talked and prayed about it, and both felt led to pursue adoption through the foster care system — but at that time we weren’t considering a teen. We agreed that if either of us got “freaked out” during the process, we’d stop. Through all the classes and paperwork, that never happened. Finally, everything was submitted, and we waited. Our paperwork was misplaced, and it was months before we even knew about it. We were frustrated, but we prayed that we would know when the right child came along, and that God would show us this by cutting through the red tape and making the process speedy and relatively easy. A common question: Why did we adopt a teen? In May 2009 our caseworker sent us info about a 14-year-old girl named Lindsey. Despite that fact that she was older than our file said we intended to adopt, her caseworker felt we’d be a good match. Again, trusting that God would show us if this was not His will, we proceeded to the next step. Shortly after that email, we had a whirlwind of reviewing Lindsey’s file, teleconferencing with her caseworker, then meeting Lindsey just two days later. We never imagined a meeting like that could be anything but awkward, but both caseworkers said it was the most comfortable first meeting they had ever seen. Just a few weeks later, we signed the necessary papers and moved Lindsey into our home. This was not the usual time-frame; this was an answer to prayer. Because of Lindsey’s age, she had to give consent to the adoption. For most of her years in foster care, she was adamant about not wanting to be adopted. However, at the church she attended with her foster family, the pastor’s wife (who was adopted at age 12) helped Lindsey make the difficult decision to say yes to a permanent family. 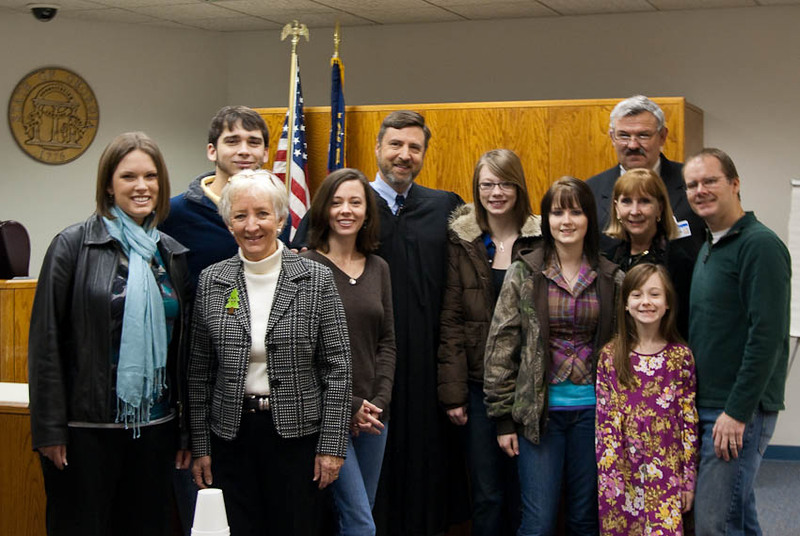 December 2009: Lindsey legally became our daughter. People have asked why we would want to take on someone else’s problem. The answer: because of God’s command in James 1:27. Adoption is a picture of what God did for us in adopting us as sons and daughters, making us co-heirs with Christ. By working out so many details in our story, He has shown He cares not only about the big things, but the small things, too. Have we had difficult days? Goodness, yes! Parenting is never easy — but hard doesn’t negate good. May 2008 ~ Our home study was completed. July 10, 2009 ~ We signed “Intent to Adopt” papers and she moved in. December 17, 2009 ~ Lindsey officially became our daughter. I continue to blog our journey of life and parenting after adoption, so I hope you’ll keep following along. If you’d like, you can subscribe by email. Copyright ©2010-2019 See Jamie Blog. | All rights reserved. | See policies.